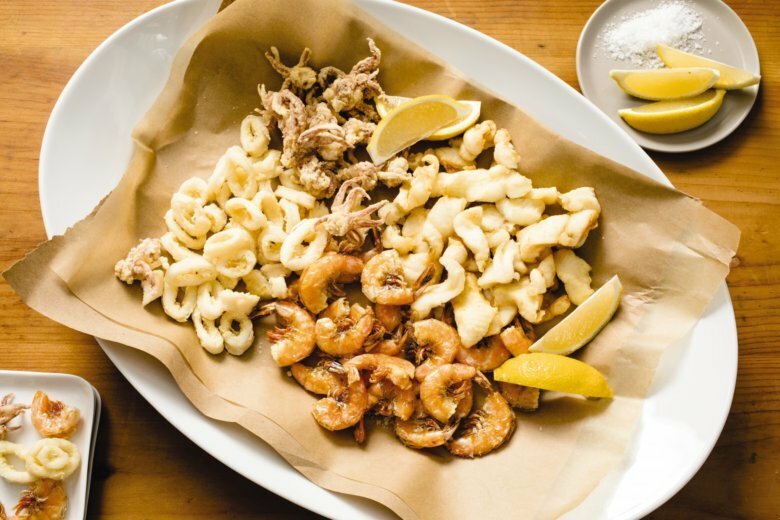 Mixed fried seafood — or fritto misto di mare — can be found throughout Italy; however, the most iconic and evocative incarnation hails from Campania. Indeed, it’s easy to imagine sitting in a Neapolitan trattoria eating crisp, piping hot tidbits of fried seafood while looking out on the Bay of Naples. Red mullet, squid or cuttlefish and shrimp are some common choices you might find in classic versions. The seafood is lightly dusted with flour before frying, and it must be eaten right from the pot to be crispy. For the fish, easy-to-find, mild-tasting sole or flounder fillets were thin enough to cook through in the time it took the coating to adequately brown. The shrimp are fried and eaten shell and all, as the shell fries up crisp. We found that by cutting through the shells, we could achieve even more delicate results because moisture could quickly escape. To ensure that the shells fry up crisp, avoid using shrimp that are overly large or jumbo. We prefer 31- to 40-count shrimp here, but 26- to 30-count may be substituted. Use a Dutch oven that holds 6 quarts or more. Trim any squid tentacles longer than 3 inches. Adjust oven rack to middle position and heat oven to 225 F. Using kitchen shears or sharp paring knife, cut through shell of shrimp and devein but do not remove shell. Pat shrimp dry with paper towels. Set wire rack in rimmed baking sheet and line with triple layer of paper towels. Add oil to large Dutch oven until it measures about 2 inches deep and heat over medium-high heat to 400 F. Whisk flour and cornstarch in large bowl until combined; set aside. Carefully add shrimp to oil and cook, stirring occasionally, until lightly browned, about 3 minutes. Adjust burner as necessary to maintain oil temperature between 350 F and 375 F. Using skimmer or slotted spoon, transfer shrimp to prepared rack. Season with salt and transfer to oven. Return oil to 400 F. Pat squid dry with paper towels. Dredge squid in cornstarch mixture, shaking off excess, and carefully add to oil. Cook, stirring as needed to prevent sticking, until squid are crisp and pale golden brown, about 2 minutes. Transfer to rack with shrimp. Season with salt and transfer to oven. Return oil to 400 F. Pat sole dry with paper towels. Dredge sole in cornstarch mixture, shaking off excess, and carefully add to oil. Cook, stirring as need to prevent sticking, until sole is crisp and pale golden brown, about 3 minutes. Transfer to rack with shrimp and squid. Season with salt and let drain briefly. Serve immediately with lemon wedges. Nutrition information per serving: 345 calories; 182 calories from fat; 21 g fat (2 g saturated; 0 g trans fats); 225 mg cholesterol; 569 mg sodium; 15 g carbohydrate; 0 g fiber; 0 g sugar; 24 g protein.